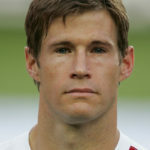 Brian McBride is a retired American soccer player who played as a forward for the Columbus Crew, Fulham and the Chicago Fire and is the fifth highest all-time leading goalscorer for the United States national team. For much of his career, he played in Europe. During his time with Fulham, McBride became a fan favorite, as well as team captain. He would eventually become ‘Player of the Season’ two times. After leaving the club, they renamed the sports bar at Craven Cottage McBride’s in his honor. "I enjoyed being involved in team sports and making close friendships."